New realtor.com mobile app lets users search viewed listings from their mobile home screens without opening the app. The app also weaves 3-D map views into its search experience. It looks like the app is supposed to complement realtor.com's longstanding mobile search app, not replace it. Screen shot showing 3-D map view of realtor.com’s new mobile search app. Streamlining the process of sorting through listings while on-the-go, realtor.com’s latest search app lets users call up listings they’ve already viewed through the app without having to open it. 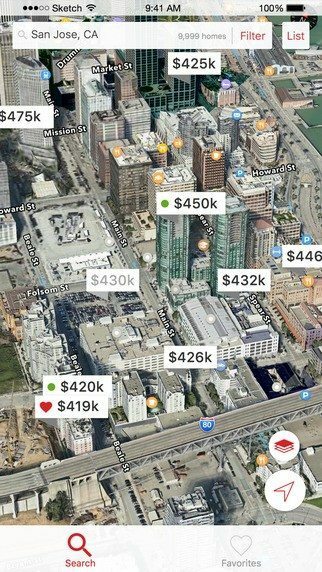 The realtor.com listing portal has also upped the ante of its mobile offering by weaving 3-D maps into the app’s search experience. Dubbed “realtor.com Express Home Search,” the app was built with “simplicity” and “efficiency” in mind, Move Inc. said in a statement. “Rather than adding more options, we’re giving them easier access to the most comprehensive database of for-sale homes in the U.S.,” said Tapan Bhat, chief product officer for realtor.com. That statement may not do justice to the app’s 3-D and home screen search elements — both of which are new to realtor.com’s mobile offerings — but it does capture the general feel of the app’s interface, which is cleaner and simpler than realtor.com’s other mobile apps. It looks like “Express” is supposed to complement realtor.com’s existing for-sale search app rather than replace it. The new app’s page in the iTunes store advises viewers that Express only shows homes for sale and to download realtor.com’s longstanding mobile app, “realtor.com Real Estate App,” for more features. Express’s home screen search capability lets users type cities, MLS numbers or prices into the search bar of their mobile device’s home screen for quick access to listings they’ve already saved or recently viewed inside the search app. In certain markets, users can also view homes in 3-D by selecting “3D” on the app’s map view, tapping on locations and using their fingers to zoom in and out. Other features of Express include school search, an open house locator and the ability to save searches and listings. You can get it on iOS and Android. This story has been updated to reflect a clarification made by Move Inc. that Express users can only use their mobile device’s home screen to see listings they’ve already saved or recently viewed inside Express. A previous version of this story incorrectly suggested that Express users could conduct new property searches from their mobile device’s home screen.